At the headquarters UNII in Marghera Venice, there is a library relative to the navigation in inland waters which is the sole one in Italy. The collection contains about a thousand books, as well as magazines and studies regarding this matter and all acts of conferences to which UNII took part. The dates of publication of the materials consulted goes from a historical cartography of the Port of Malamocco 1859 to texts of our days. 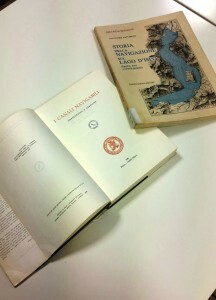 The library is open to the public by appointment to be taken at the secretariat of UNII and is frequented mainly by scholars researching historical information, techniques and the latest trends of the whole Italian navigable system. At the headquarters UNII there is also the historical river navigation containing a number of documents starting from 1919, which can be consulted with some restrictions to preserve the deterioration. The complete list of all material collected is contained in the library catalogue. The Italian Union Inland Navigation, in order to stimulate interest in an ever deeper knowledge of the role and functions of inland navigation in Italy, consistent with the policy of the European Community, in the late 80’s has launched a scholarship in memory of dr. Mario Bernardo. The themes of the scholarships were the following: 1 scholarship: “The inland as a new resource for the ‘padano Venetian economy and its integration with the maritime cabotage”. 2nd scholarship: “Situation and perspectives of the Veneto Po waterway system connected to the Adriatic Corridor”.